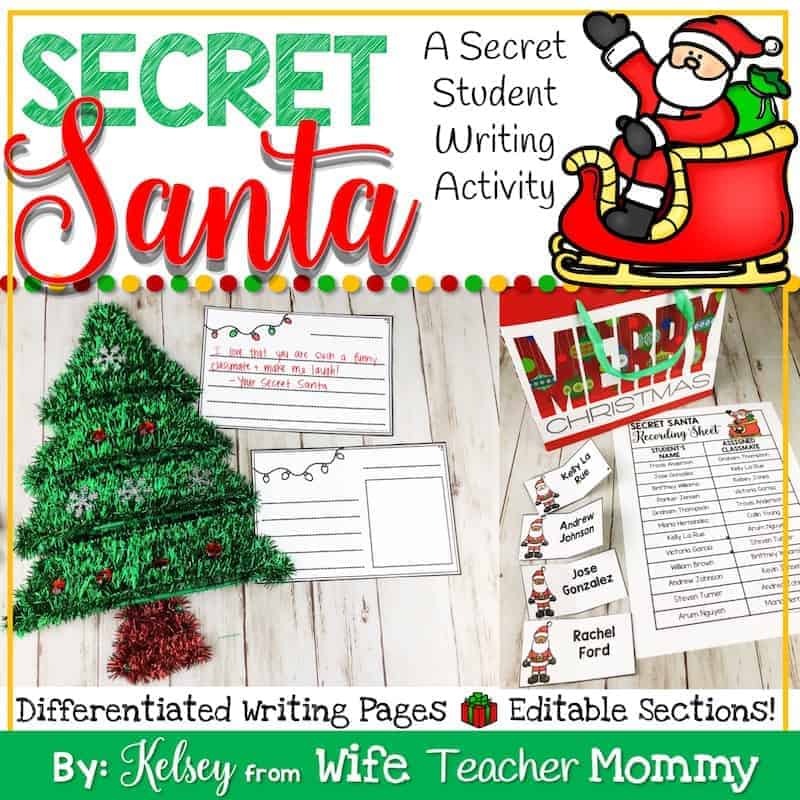 Secret Santa Writer’s Workshop Unit is a classroom community building service unit and writing unit. Students will become a “Secret Santa” for another student in the class. 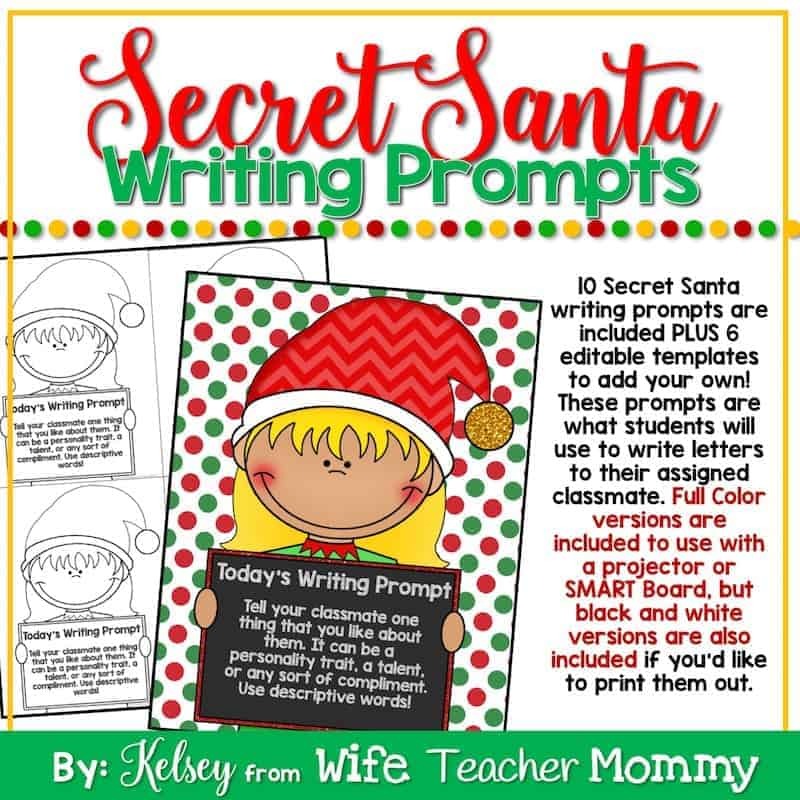 Students will have 10 writing prompts to write letters to their Secret Santa. They will also have 4 accountability writing prompts in which they report their acts of service to their teacher. At the end of the unit, the students reveal their Secret Santa with a fun activity! Best of all? 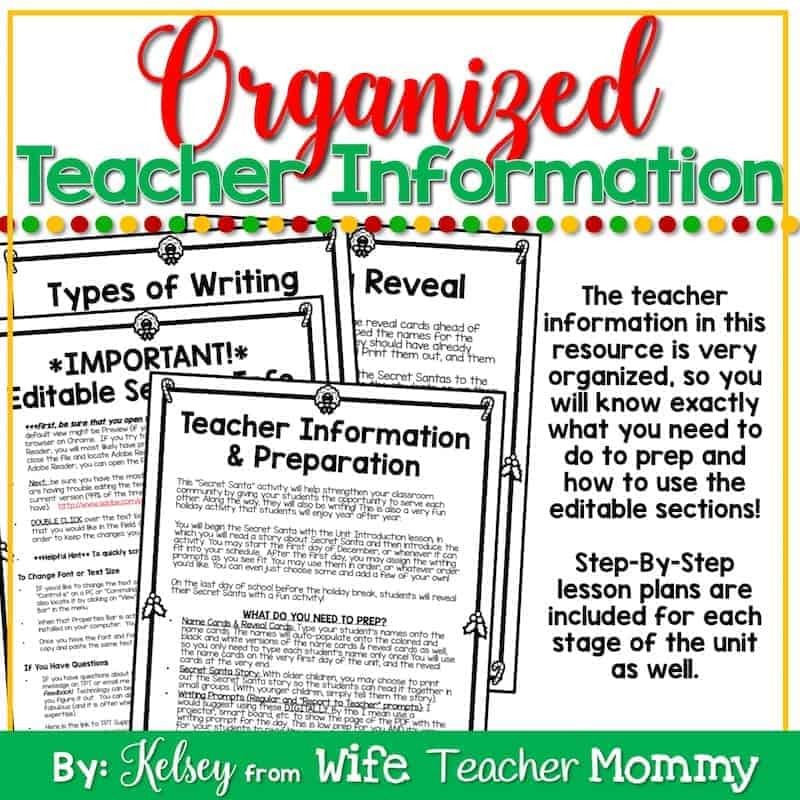 This unit include lots of editable sections! You will type your students’ names only one time, and they will auto-populate as needed throughout the unit. If you live in a VAT country, click here to purchase on TPT. All the unit information and preparation is clearly laid out- so you know exactly what you need to do! This lesson plan is a fun way to introduce the unit using the original Secret Santa story. The lesson shows you how to lead from the story to the students becoming a Secret Santa to another student. 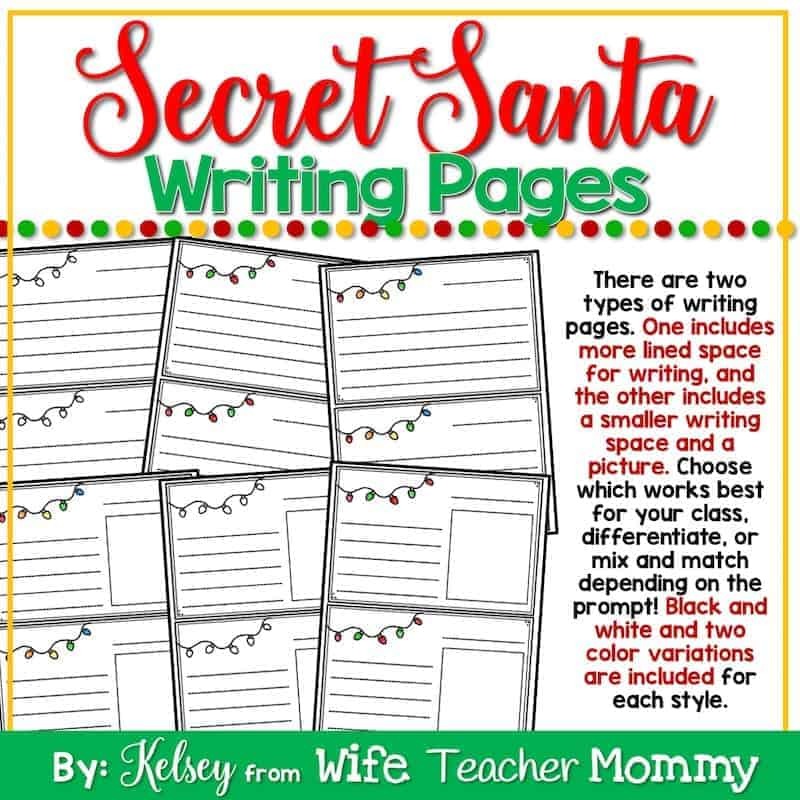 This page clearly lays out the two types of writing prompts: Secret Santa writing prompts and Report to Teacher Writing Prompts. 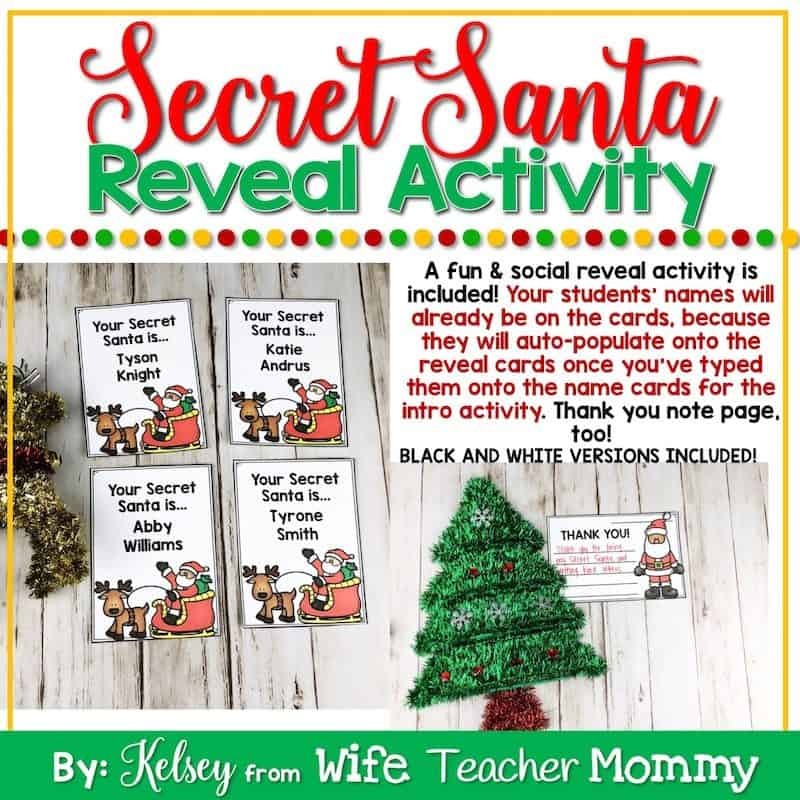 This reveal activity is a huge hit! The students will have a lot of fun guessing who their Secret Santa is with this social activity. An original Secret Santa story is included to introduce the unit. The story explains about how Santa asked another boy to include his classmate and become a Secret Santa, and how the two boys ended up becoming friends! An editable parent letter has been added! It is typed into and ready to go so all you need to do is type your name and the date. You may edit the contents of the letter as well, if you’d like. 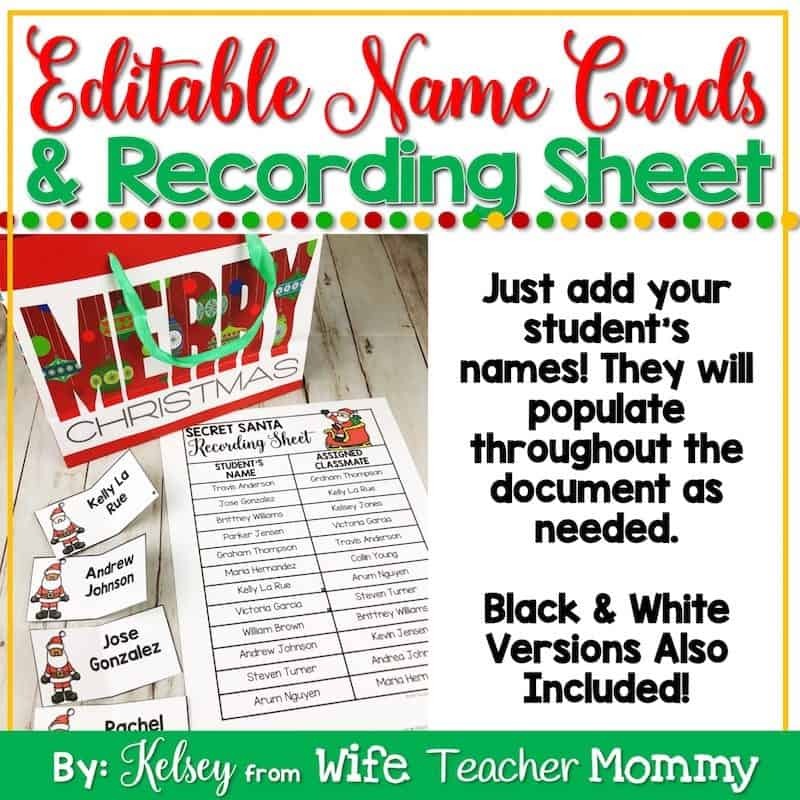 Add your students’ names to the student name cards so they are ready for the students to draw a name to become a Secret Santa! FOR YOUR CONVENIENCE, you only need to type your students’ names into the document ONE TIME, and they will auto-populate onto the Secret Santa Recording Sheets AND the Reveal Cards! No need to type them out three times. Pretty cool, right? Color and black and white included! This adorable recording sheet is for you, as the teacher! This helps you keep track as you deliver the letters. It is also inevitable that students will forget who they were assigned to, so it’s great to have your list handy. You can type the assigned classmate’s name, or print out the form and write them as the students draw names. Color and black and white included! These prompts are what students will use to write their letters to their assigned classmate. There are 10 prompts that students will use to write to their assigned classmate. (Example: “Tell your classmate one thing that you like about them. It can be a personality trait, a talent, or any sort of compliment. Use descriptive words!”) There are 10 pre-made prompts included, and 6 editable pages for you to create your own! Full-color versions are included for you to display using a SMARTBoard, Projector, etc. This makes it easy for students to see the prompts at all times. If you prefer, black and white versions to print out are also included. The second kind of writing prompt the students will get are the “Report to Teacher” prompts. These keep the students accountable for looking after their assigned classmate as a Secret Santa. They also help you to see how the students are helping each other! 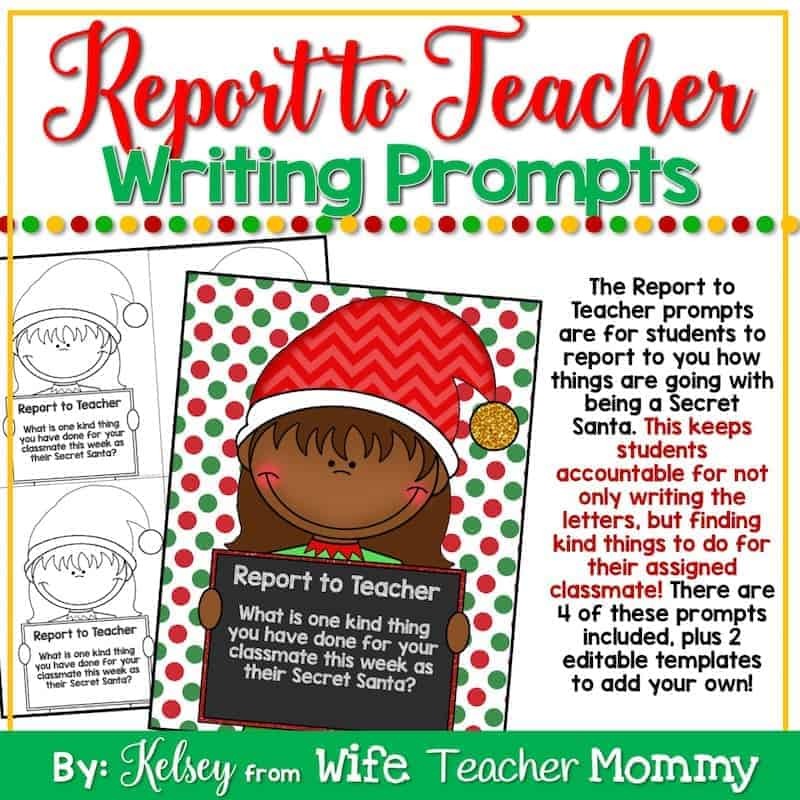 (Example: “What is one kind thing you have done for your classmate this week as their Secret Santa?”) There are four of these prompts pre-written and two editable templates for you to add your own! Full color versions for projecting or black and white for printing are both included. Student Writing Pages- MULTIPLE VERSIONS! These writing pages will be used for all of the writing prompts. There are two levels included. One is just lined for all text. Another includes fewer lines and a box for drawing a picture. There are 2 color varieties and a black and white version for each one! The student’s names will automatically show up on these reveal cards to reflect what was typed into the initial student name cards, so they are ready to print! Just print them and cut them, and they are ready for the final reveal activity. After the Secret Santas are revealed, have the students write a thank you letter to the student who was their Secret Santa! You May Also Enjoy my other Christmas Products to spread Christmas Cheer! You can check out my Ready to Go Sub Plans for grades Pre-K-6 by clicking here!